Produktinformationen "The Magic Stick of Plenty"
Come out, gold, tattoo tattoo! Come out, silver, tattoo tattoo! Tokkaebi, or goblins, were creatures which sprang from the Korean imagination. They were pranksters, full of mischief, but at the same time were a bit simple and easy to fool. Therefore, tokkaebi have become naughty but enjoyable friends in the child’s land of fancy. 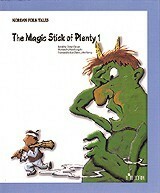 The Magic Stick of Plenty is the most widespread of the old goblin stories. It raises children’s curiosity with its ability to produce whatever you name when you tap it on the ground. Printed in two directions, the first part of the story starts from one cover and the second part (the other way up) from the other cover, so that, children can freely read the second part first. He is a promising young poet. He made his debut in literary circles when he won the New Face Prize awarded by Korean Literature. He has devoted himself to writing poems and stories for children. He studied painting in college. He is an active illustrator for children’s books. His pictures are both lyrical and humorous. He is well known for depicting various styles of Korean goblins. Weiterführende Links zu "The Magic Stick of Plenty"
Unser Kommentar zu "The Magic Stick of Plenty"
Kundenbewertungen für "The Magic Stick of Plenty"